Cotton recalled that this photograph was taken at the family home: ‘When we were young my sister Joyce and I shared this room. 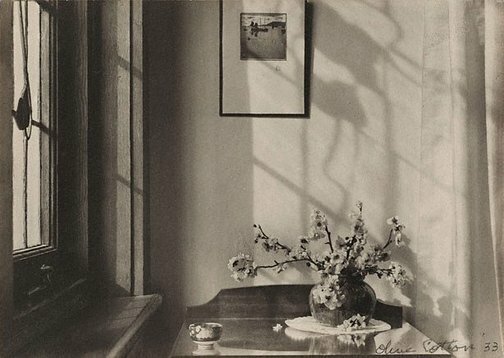 Its stained-glass windows had a simple floral motif which cast attractive shadows on the wall in the late afternoon.’3 The play of light and shadow, which is such a remarkable feature of this work, recalls Edward Weston’s celebrated image ‘Epilogue’ 1919 which may have been known to Cotton by 1934. Unlike Cotton’s better known images, such as ‘Teacup ballet’ 1935 (AGNSW collection), which use consciously modern techniques of dramatic lighting and distorted vantage points, this image, with its fine tonal contrasts and slightly Japonisme flavour, sits firmly within the pictorialist tradition. The AGNSW has recently acquired a variation of ‘My room’ taken at a different time of day and with darker, intense shadows. Signed and dated l.r.corner, pencil "Olive Cotton '33". Signed and dated u.l.corner verso, ... "1933 Olive Cotton". Steven Miller, Photography: Art Gallery of New South Wales Collection , 'Australian pictorialism', pg.71-91, Sydney, 2007, 77 (illus. ), 87 (illus.). Olive Cotton: Photographer , Canberra, 1995, 36 (illus.). Useless beauty: Flowers and Australian art , United Kingdom, 2015, 66, 67 (colour illus. ), 235.